When you reach into your cupboard to pull out a baking sheet, it is important to choose one that is appropriate to the food you are cooking. Did you know that the shade of the pan has an effect on the way the food cooks? This is especially critical when baking cookies. Light pans reflect the heat and darker pans absorb it, often effecting the baking time. The darker pans will make food cook faster, and will often yield a darker bottom on the food you are cooking. Cookies will brown more deeply, and sometimes even burn if they are not watched like a hawk. If you opt to use a dark pan, reduce cooking time by 25% and then watch carefully to make sure that things don’t start to brown too quickly. These pans are great for things like roasting vegetables, where the darker pan will help them caramelize. Those shiny silver pans may be harder to keep that way, but they are optimal for baked goods. I use parchement paper most of the time, which helps keep them looking fresh for a longer period of time, and prevents food from sticking. Usually made of aluminium, they are light weight, easy to clean and relatively inexpensive. As they start to age, they will get a beautiful patina. I love my old, mottled and discolored pans for photography, or as drip pans, but they are no longer suitable for baking. 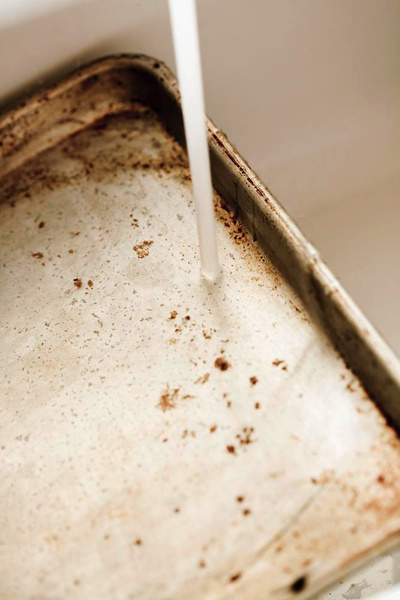 As your pans begin to darken, or have a mottled appearence, it is time to put them into retirement as baking sheets. This entry was posted on July 14, 2015 at 6:38 am and is filed under Food. You can follow any responses to this entry through the RSS 2.0 feed. You can leave a response, or trackback from your own site.